Romantis, an international satellite communications operator, has been awarded a contract at a tender announced by RSCC to provide monitoring services of remote communications zones covered by the Express-AM8 satellite (14° W). Construction is nearing completion of the monitoring center located in the city of Uberlandia (Brazil). The plan is for the monitoring of satellite capacity to be performed using two receiving antennas in the Ku- and C-bands, whereupon the signal is processed by the center’s measurement unit and subsequently transferred to the RSCC’s Dubna Space Communications Center. Dr. Harald W. Stange, Managing Director of Romantis GmbH, the company’s European Office, says: “We are grateful to our RSCC partners for choosing Romantis as the project contractor. 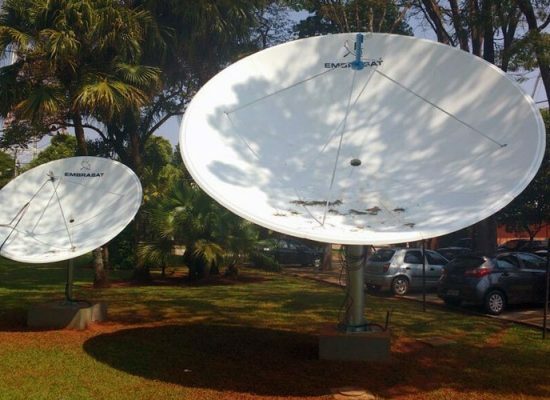 Given the unique coverage of the Express-AM8 satellite in Latin America and the great interest on the part of operators and broadcasters in the services that, in conjunction with RSCC, Romantis has demonstrated at the SET Expo exhibition 2016 (São Paulo, Brazil), we can say with confidence that the AM8 Express capacity will be in demand in the region”. “Last year, RSCC started satellite communications services in Latin America. The new modern monitoring center in Brazil will make it possible for us to work with major operators, and enter the segment of small and medium-size regional telecommunications business”, says Ksenia Drozdova, RSCC Deputy General Director for Business Development. The Russian Satellite Communications Company (RSCC) is Russia’s national satellite communications operator, whose spacecraft ensure global coverage. Established in 1967, the company owns Russia’s largest satellite constellation. The RSCC satellites are positioned along the geostationary orbital arc from 14° W up to 145° E, covering the entire territory of Russia, CIS, Europe, Middle East, Africa, Asian-Pacific region, North and South America, and Australia.